Located just to the north of Düsseldorf, Düsseldorf Airport is Germany’s third largest airport. Our Düsseldorf Airport guide includes contact details as well as information regarding airport facilities, public transport and nearby accommodation options. Information desks can be found in Departures and Arrivals, as well as at Düsseldorf Airport's railway station. The main information desk is located next to baggage claim belt 6 in Arrivals. There is also an information telephone helpline (tel: +49 211 4210). The A44 autobahn runs east-west past Düsseldorf Airport. Follow the sign 'Flughafen' at junction 31 to reach the airport. The A44 connects to the B1 (which leads south to central Düsseldorf), the A3 (which skirts the east of Düsseldorf) and the A52 (which leads north to Essen). The journey time from central Düsseldorf is approximately 10 minutes. The Sky Train transports passengers from the railway station to the terminal via car parks P4 and P5. Düsseldorf Airport is located 8km (5 miles) north of Düsseldorf. Bus:The bus station is located in front of Arrivals, from which a good selection of VRR (tel: +49 180 650 4030) regional services operate. Bus 760 runs regularly to Ratingen Ost, bus 721 runs to Tannenhof via Düsseldorf central station, and bus SB51 operates to Kaarst-Rathaus via Düsseldorf-Nordfriedhof. Several other regional services call at a separate bus station near the railway station. Taxi:Taxis leave from in front of Arrivals. Official operators include Taxi-Düsseldorf (tel: +49 2113 3333; www.taxi-duesseldorf.com) and Rhein-Taxi (tel: +49 211 212 121; www.rheintaxi.de). All official taxis are cream-coloured. Fares start at around €20 to the city centre. Rail: Regular trains link to various destinations each day from Düsseldorf Airport's railway station, Düsseldorf Flughafen. Deutsche Bahn (tel: +49 180 699 6633; www.bahn.de) services include regional, express, intercity and high-speed InterCity Express (ICE) trains that connect the airport to a number of cities in Germany. The journey time from Düsseldorf Flughafen to Düsseldorf Hauptbahnhof (Central Station) is around 10 minutes. The automated Sky Train links the railway station and the terminal building in around six minutes. Metro:The local S11 S-Bahn metro train runs directly into the airport complex and links to Düsseldorf Hauptbahnhof in the city centre (journey time: 30 minutes). Tickets can be purchased from the machines on the platform. Full banking facilities are located in Arrivals. ATMs can be found throughout Düsseldorf International Airport and its railway station. There are two bureaux de change on the departures level and a further currency exchange kiosk on the arrivals level. There are more than 40 bars, cafés and restaurants at Düsseldorf International Airport, both before and after the security screening area. Options include a Japanese restaurant, ice cream parlour and bistros serving pasta and salads. Boasting more than 70 shops, Düsseldorf Airport covers most retail needs; these range from gift shops, luggage retailers and fashion boutiques to food shops and duty-free outlets. Shops are open from early morning until late at night, seven days a week. Porters are available (tel: +49 211 421 6637). Left-luggage and a lost and found service are available on the first floor of car park P3 (tel: +49 211 421 2515). A full list of airline contact numbers for lost luggage enquiries is available on the airport's website. Other facilities at Düsseldorf Airport include a non-denominational prayer room, pharmacy, first aid service and dentist. Baby changing services are also available. The conference centre DUS conference Plus (www.dus.com/de-de/businesspartner/businessstandort/konferenzen-und-tagungen/dusconference-plus) has extensive conference facilities located on the gallery level of the main terminal offering a range of conference rooms that can accommodate small groups, as well as larger space for up to 320 delegates, 3 foyers for events, 15 board rooms for small meetings and work stations for business travelers. Additionally, a multi-purpose meeting and event centre (tel: +49 211 421 71502) is situated at the airport's railway station. There are also a number of business lounges available to passengers at the airport, including the Hugo Junkers Lounge (tel: +49 211 421 3712) which has 185 seats, free Wi-Fi and complimentary international magazines and newspapers. The on-site Sheraton Düsseldorf Airport Hotel (tel: +49 2114 1730; www.sheratonduesseldorfairport.com) and Maritim Hotel Düsseldorf (tel: +49 2115 2090; www.maritim.com) offer numerous meeting and conference rooms and business services. Wi-Fi is available throughout Düsseldorf International Airport (the first 30 minutes of browsing is free of charge), and there are fixed internet access desks at various locations. Public telephones can be found at numerous locations within the terminal and railway station. Düsseldorf Airport is fully accessible for disabled passengers, with lifts and ramps where needed and wheelchair-accessible toilets. The Sky Train is also accessible for wheelchair users. Wheelchairs are available on request, passengers should inform their airline of their requirements prior to travel. Drivers displaying disability identification can park in the 'terminal' and 'langzeit' car parks for free – these drivers are advised to use car parks P1, P2 and P3; for more information on disabled parking contact airport parking (tel: +49 211 421 6637). There are several car parks available with direct access to the terminals. These are mostly short-term car parks, while the long-term car parks are further away from the terminals – P4 and P5 are connected to the terminal via the Sky Train (journey time: 2 minutes). Additional long-term/economy facilities are also a short distance from the terminals. Other services include valet parking, car washing and Audi and VW repairs. 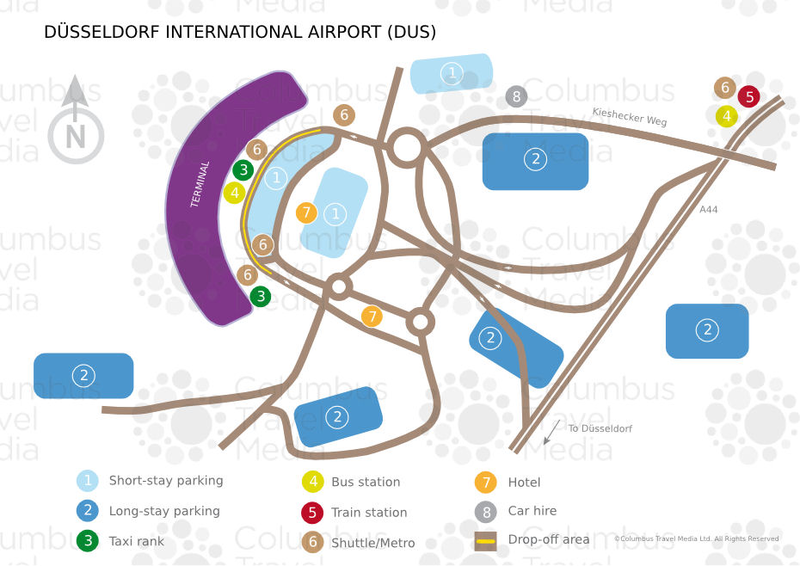 For further parking information, contact airport parking (tel: +49 211 421 6637). International car hire companies represented at Düsseldorf Airport include: Avis, Budget, Enterprise, Europcar, Hertz, Thrifty and Sixt. Desks are located in the central arrival hall. Hire cars should be returned to the car hire centre next to Departures.